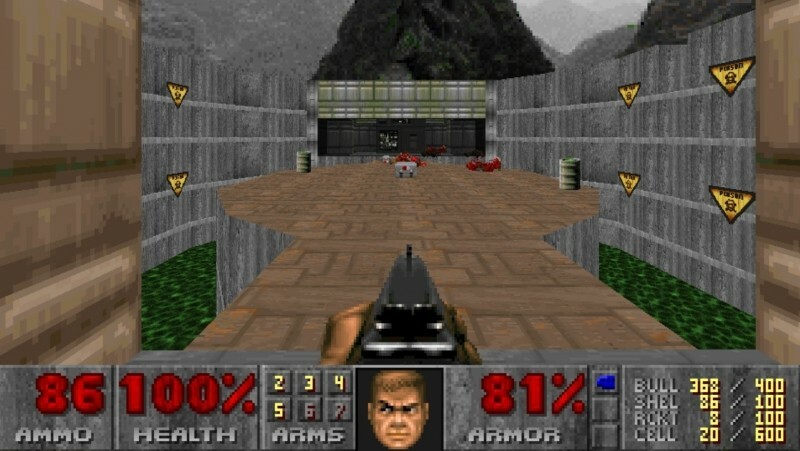 I have a confession to make: my introduction to shooters began with Halo and Half-Life 2, and because of this, I only recently tried my hand at Doom, id Software's 1993 shooter. Because Doom was so old, I figured it had nothing to teach me. Surely other games had done what Doom had, only better, right? I was wrong. I have now played the game. It taught me a lot, especially about how a game can capitalize on provoking a player's curiosity and how it can make the most out of the element of surprise. I can now see why Doom sits atop many people's "greatest game of all time" lists. It is tightly-constructed, absolutely fun once you get into its groove, and one of the most influential video games ever made. In the twenty-one years since the game's release, a lot has been said about Doom, usually by people who've played it time and time again and know the game inside and out. I've just played Doom for the first time, so my outlook is a bit different. E1M3: Toxin Refinery is the level where Doom began to click for me. I played on the "Hurt me plenty" difficulty, which is Doom's default. It's worth noting that enemy spawns change via difficulty—where newer games often simply change enemy health and damage, Doom changes enemy spawns. Playing the level E1M1 on Ultra-Violence difficulty, for instance, adds former human sergeants who aren't present on Hurt Me Plenty. It's a neat take on difficulty that I wish more games would emulate, not just because it's a more creative challenge, but because it enhances replayability. At the start of E1M3, you'll find a giant pool of toxic goo. On the other side of it, you'll see a former human sergeant. One of the cool things about Doom is that it often shows you things before you engage with them. Contrast this with a modern military shooter that often has you enter a room, enemies flood in from the other side, and a firefight begins. Not so here: you see the most dangerous enemy in the room, but you don't have to deal with him immediately. Take your time, think it through. Later on, you'll enter a hallway. Through a window to your left, you can see a blue soul sphere sitting on a plinth. Soul spheres boost player health, though, with Doom's limited visual palette, one might assume it's just some sort of set decoration. I thought it was at first, but around it, I noticed imps, Doom's fireball-throwing demons. Unfortunately, I couldn't figure out how to get to the imps or the soul sphere, so I continued onwards. This is one of the really cool things about Doom. The soul sphere is surrounded by monsters, which means there's got to be a way to get to it, though not from where you're standing. Doom is showing you something you can't get to, which encourages you to ask questions like "What is that?" and "how do I get there?" Can you imagine a modern shooter like Call of Duty orBattlefield doing such a thing? With regenerating health systems, there's no reason to include a massive health bonus in the game, much less dangle it in front of players and encourage them to figure out how to reach it. In the hallway, you can continue forwards, through a door, or take a left into a small room full of monsters. The monsters in Doom are like breadcrumbs. There's no need for modern-style map markers to tell you where to go when the allure of more gameplay nearby is enough. With monsters in the next room, Doom lures players in, saving the door for later. Take a left, clear out the little room, and you'll find a switch. Flip it. If you're paying attention, you'll also notice that one of the walls of this little room is a lift. Hop on and it'll take you to a room full of health and ammo. When you're done, just ride it back down. If you return to the section of the hallway that overlooks the soul sphere, you'll find that the switch you flipped opened a door to a room full of computers. On the left side is a secret lift, and if you hurry, you can catch it. Doing so will trigger a secret door leading to the soul sphere room; on the base of the plinth, you can find a switch which lowers it and delivers your prize. Head back up the stairs, and you'll spot a similar lift across the room. Two cool things are happening here: first, Doom is using this moment to teach players that crossing certain thresholds can trigger secrets. Additionally, it's not possible to see a second secret door upon entering the computer room; it's only possible when you exit the first secret room that you see the second. Enter it, and you'll find a rocket launcher, ammo, and enemies. Keeping a sharp eye, you might notice a small tunnel off to the side, which will lead you to another secret room, then another, and finally, the first secret room, depositing you right back where you started, freeing you to move forward. Kill some monsters, look around, and you'll find a path through a room full of more toxic goo. The path forks with another pool of goo in the middle. It doesn't matter which one you take, just kill the monsters and cross the room. On the other side, you'll be ambushed. I like to dispatch the guy on the right first, since there's only one of him, but the first time I did, I was using a shotgun, and I shot both the guy and the barrel next to him, which exploded, killing me. Not a smart move. Surprise is a useful tool that Doom's designers use well. In the next room, you'll find a blue keycard, the one you need to leave the level. Unfortunately, when you take it, the lights shut off, a door opens, and three imps ambush you. Despite the graphics being decades old, I was still startled the first time. It's a great moment that spices up the way you play, if only for a short while. Now it's time to backtrack to the beginning. If you look down in the forked pathway, you'll notice a health kit in the goo pit below and a concrete platform next to a switch. Jumping down there, you can flip the switch and raise that entire section out of the goo, allowing you to get out of the pit. Here, Doom reveals something new through backtracking—it's not something we might have seen heading forward, but on our return to the beginning, it's clear how to access the health kit. I've played some bad games that encourage backtracking without anything to show for it, but Doom offers a prize—one which, by the way, would feel meaningless in a game with a modern regenerative health system. Back at the start, you'll find that a bridge has been raised above this toxic goo switch too, the result of one of the switches you flipped earlier. It looks like it runs straight into a wall, but as you now well know, just because something looks like a wall doesn't mean it is. It's often a secret door. In this case, it leads you to a small room with some goodies inside. This is my favorite moment in E1M3. It's a trap! Grabbing the goodies triggers the walls to pull away, revealing plenty of monsters. Once you defeat them, the walls pull away again to reveal even more monsters. When you win, you can take the secret exit out, bypass a bunch of levels, and find yourself in E1M9. Of course, if that doesn't suit you, you can always complete E1M3 the normal way. Doom will support either approach. Doom has things I think a lot of newer games lack. Its health system encourages players to move around the space in search of resources. You can't simply stand still and wait for your health to come back, you have to actively seek out things to find. This feeds into Doom's secret hunting. There's no in-game training that tells you "sometimes, when you enter a room, you trigger a secret," or "if a wall has a different texture, it's a secret door." These things are hinted at clearly, and players are encouraged to figure out how they work. In the soul sphere's case, players literally get to see the prize, but they have to figure out how to get it themselves. Another cool thing Doom does is surprise. I can't even remember the last game I played that felt as surprising as Doom does. I love hearing an enemy ready to fire, turning sharply, shooting him, and accidentally killing myself in the process because I didn't know an explosive would be there. Suddenly having all the lights go out and barely being able to see was a moment of pure glee for me. Expecting to pick up some health, being ambushed by a bunch of monsters, then surviving only to be ambushed again is simply one of my favorite moments in video games. Ever heard of chronological snobbery? It's a term for a logical fallacy coined by novelist C.S. Lewis to describe the belief that things from the past are not as good as things from the present simply because they are old. Over the years, I've met plenty of people who've fallen prey to its charms, thinking that just because a game is old, it doesn't have anything to offer. I spent years thinking I didn't need to play Doom, but I was wrong. Few shooters these days rely on curiosity or surprise the way Doom did. While I love playing Call of Duty and Far Cry as much as the next guy, I can't say either series ever made me curious or surprised. Modern games are fun—they have their place—but old games still have something to offer. They're still worth playing. They're still meaningful and fun. GB Burford is a freelance journalist and indie game developer who just can't get enough of exploring why games work. You can reach him on Twitter at @ForgetAmnesia or on his blog. You can support him and even suggest games to write about over at his Patreon.